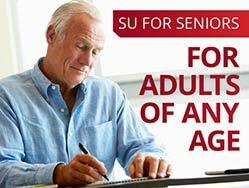 REDDING, Calif. - Simpson University for Seniors is offering two courses in October for adults of any age. The non-credit, no-homework classes, which begin Oct. 3, are taught on Simpson’s campus by university professors and professionals in their field of expertise. Classes meet from 10:20 to 11:20 a.m. and 11:30 a.m. to 12:30 p.m. on Mondays, Wednesdays and Fridays. The Minor Prophets (10:20-11:20). This course is an overview of the last 12 books of the Old Testament, called the Minor Prophets. While these men were called by God to speak to their generations, their words contain timeless messages. Presenter: Glenn Schaefer. Growing up Under the Third Reich (11:30-12:30). Presenter Horst Christian, who was born in Berlin in the ‘30s, shares a first-hand account of what it was like to grow up under the Nazi flag and experience World War II as a schoolchild.